This is actually not the end of the Narbonic Babies. Andre drew an additional wrap-up strip, which I ended up running the Sunday after this. In the meantime, please enjoy these adorable drawings. Some cartoonists are really good at drawing kids, and some cartoonists are really bad at it, and there seems to be no middle ground; you either get it or you don’t. 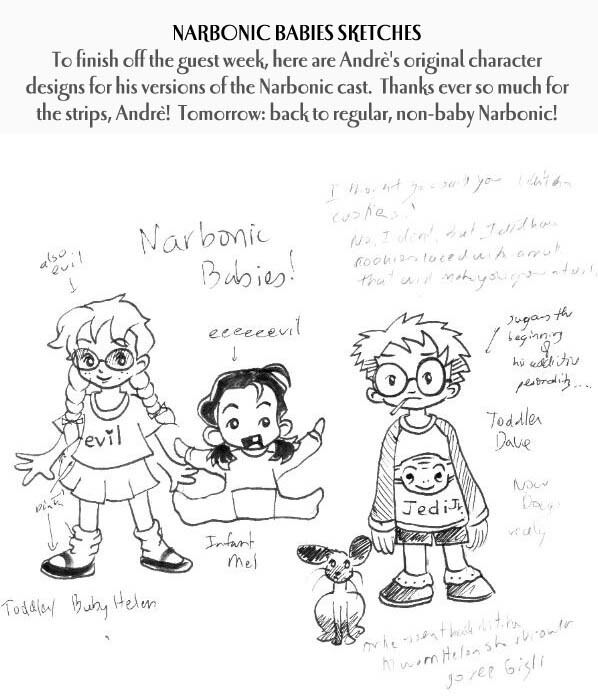 Andre draws great kids, and also great cute stuff in general. So thanks again, Andre! I believe this is the last guest week in Narbonic. From here on out, it’s all me, at least on the weekdays. I had a lot of plot to get through.